The kids wanted to convert the toy room into a computer zone. That meant they we had to make some tough decisions and donate many of their toys. They chose to donate their large Play-Doh kits to the Kindergarten classes at their school. They were happy to replace those sets with a single “Play-Doh Shape and Learn” set. 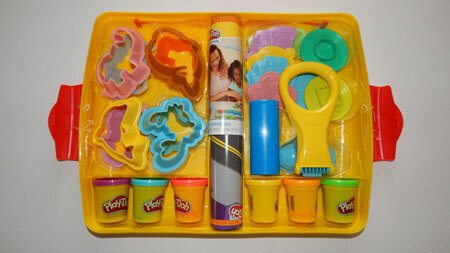 The “Play-Doh Shape and Learn” playset comes with everything you need for hours of fun! 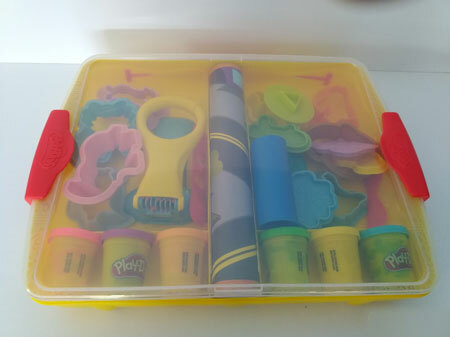 The set includes: 1 Junior Fun Factory Tool with noodle rail, 8 animal stampers (elephant, gorilla, crab, dolphin, rabbit, chicken, pig and whale), 5 vehicle stampers (plane, train, boat, car and bicycle), 2 shape stampers (circle/rectangle and square/triangle), 6 cans of Play-Doh (purple, blue, pink, yellow, gold and green), rolling pin, 3 double-sided playmats (road/farm, lighthouse/jungle and beach/train tracks) and a Together Time Guide (French and English). The playmats create fun play zones for your child. We did experience a problem with them curling and needed to tape the corners down which resulted in a small tear. After reading Together Guide, I discovered that the lid of the container is to be placed on top of the playmat to protect it during use. Personally, I would recommend laminating the mats to make them more durable. This way more than one child can play with the playmats at a time. Each mat features a scene that your little one can explore. 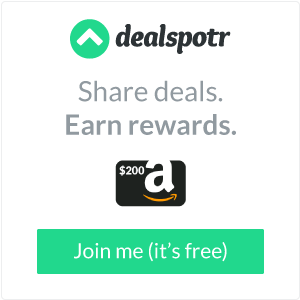 Cut out shapes and place them on each scene to tell a story. Your child can use his imagination to make his own creations like flowers, rocks or anything else he can imagine! 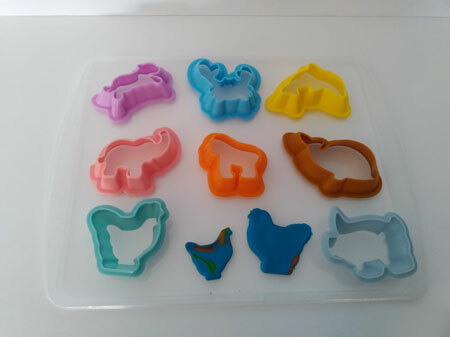 The animal stampers are a great size for small hands. 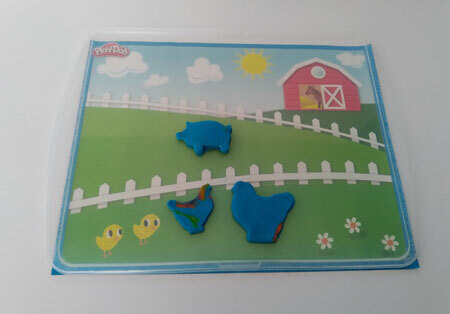 The stampers have a skinny edge and a fat edge that easily cut through the Play-doh to create fun shapes for the playmats. The skinny side creates “baby” animals and the fat side makes the “mom or dad” animal, according to my children. 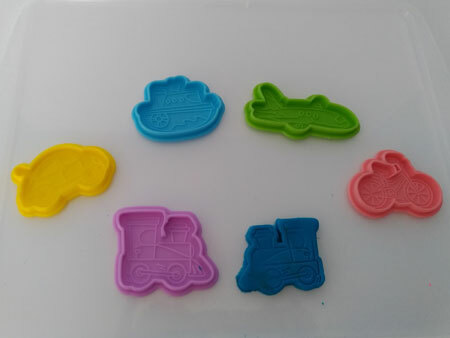 The kids struggled to get the patterns onto the Play-Doh with the vehicle stampers. The Play-Doh needs to be rolled out a little thicker than when they use the animal stampers. The Junior Fun Factory tool is my daughters’ favourite item. It comes with a rail that will create “noodles” in three different sizes. 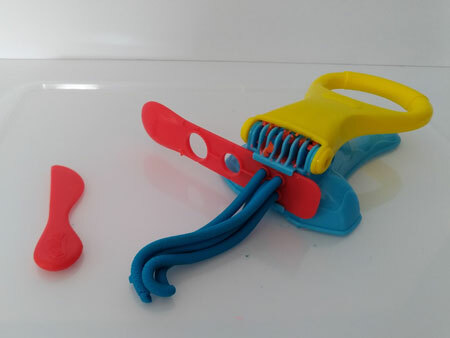 It’s easy to use, just place the Play-Doh in the slot and press the lever. To make longer noodles, just add more compound. The tool is difficult to clean. The Play-Doh gets caught in the small crevices and is difficult to remove. My favourite part of the whole set is that it comes in a convenient box to store it all in. This makes clean-up a breeze and it sits nicely on a shelf ready for the next play time. The kids like that all the pieces easily fit inside, without having to be strategically placed. The Together Guide offers great ideas to help you customize playtime to your child’s interest and skill level. 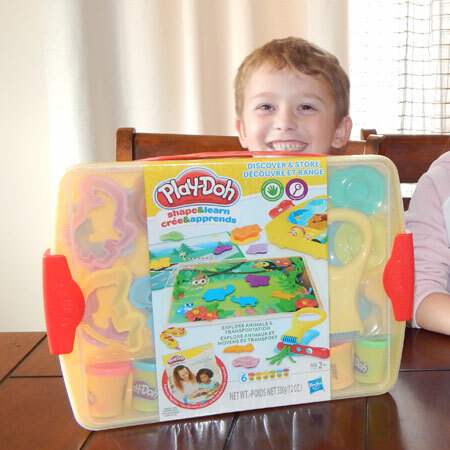 The “Play-Doh Shape and Learn” playset is fun for kids of all ages. Choose your favourite playmat and stamper and let the fun begin! *Disclosure: I received a complimentary “Play-Doh Shape and Learn” playset in exchange for my review. All opinions are 100% my own.